Miami’s 2017 Art Basel festivities are underway, and have brought none other than dance music pioneer Armin van Buuren to pump up the volume. Stealing a token spot at The Fontainebleau’s LIV Nightclub this past Saturday, December 2nd, the Dutch “Dominator” delivered yet another magnetic showdown for club-goers in attendance. An adrenalizing, mesmerizing, and inspirational deliverance, the performance fell nothing short of expectations, giving off an experience as ritzy and extravagant as LIV itself. Living inside the world famous Fontainebleau Hotel, LIV exudes luxury in every aspect. 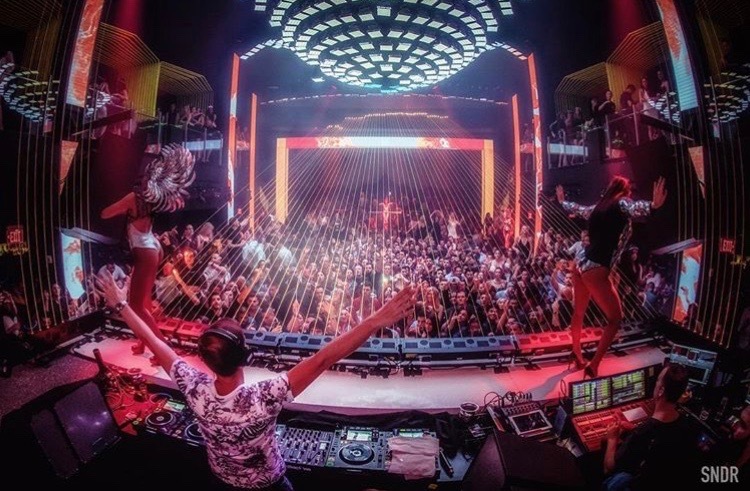 The high-octane club is home to the world’s top talent and celebrities, hosting only the best of the best and providing the ultimate Miami nightlife experience to guests. Appearing to a full house for his 1:30 am set time, the one and only trance legend himself took off to a high-energy start. Blaring through the speakers while hundreds of colorful “A” video tiles swirled above the excited crowd, Armin immersed the masses in sensory overload. Never-ending vibrant lasers darted across the 30,000 sq. ft. space while blinding strobes caught your eyes with every heart-pounding beat. Lavish dancers in space-looking ASOT bodysuits celebrated beside him during the set while bottles of Dom Pérignon were joyfully passed around to tables. Cold gusts of refreshing smoke poured out every so often, and bright blue glow stick headbands made their way across the dance floor to dazzle up the crowd. The wild ride powered on for three hours with mixes of tracks like Tiësto’s “Ayla,” Gareth Emery & Standerwick’s “Saving Light” feat. HALIENE, Markus Schulz’s “The New World,” and Dash Berlin’s “Shelter.” Also striking throughout were lovable Armin classics including “This Is What It Feels Like,” “I Need You,” “You Are” with Sunnery James & Ryan Marciano, and “I Live For That Energy.” His remix of Kensington’s “Sorry” created an ocean of lights as fans held phones mid-air in unison. Faces dropped per usual with his shocking “This Is a Test” bit, and the group went wild with “Great Spirit”’s thundering force. The top-notch performance closed out in the wee-hours of the night with Armin’s monstrous “Sunny Days” rework, progressing from a slow and heartfelt intro to an upbeat and powerful finish, of course under a monstrous flood of LIV-imprinted confetti. It was an undeniably special and unforgettable night, and top of mind is the way he beams on stage all night long with a gigantic smile spread across his face, arms wide open as only Armin does. Soaring to the highest of heights in all his glory, we are certain Armin will continue to lift spirits across the world to a higher being – to a state of trance.